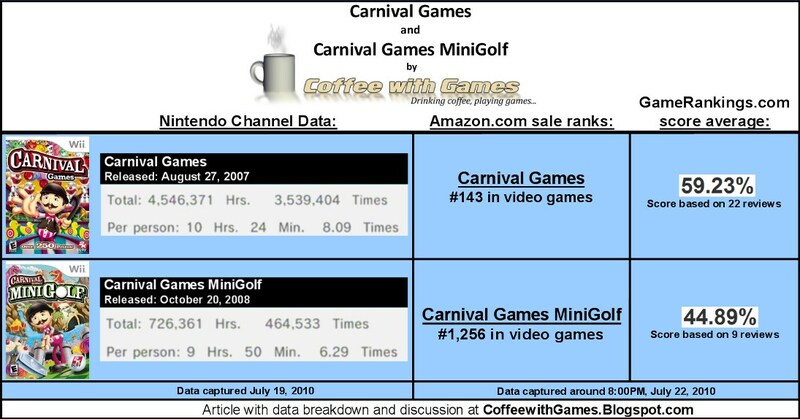 Coffee With Games: How Much Have the Carnival Games Been Played? How Much Have the Carnival Games Been Played? Carnival Games was released on August 27, 2007 with a MSRP of $39.99. Carnival Games MiniGolf was released on October 20, 2008, also with a MSRP of $39.99. Both games featured multiplayer, for up to four players. 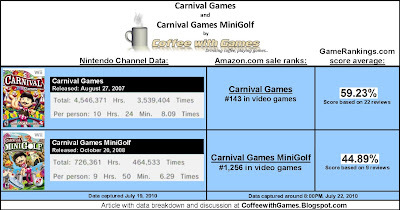 The play-time data shown below represents approximately 1,058 days of reporting for Carnival Games, and 638 days of reporting for Carnival Games MiniGolf; since the release dates of both games. Carnival Games has 437,503 players reporting their play-time data, on the Wii's Nintendo Channel. Carnival Games MiniGolf has 73,852 players reporting play-time data. Carnival Games has 4,546,371 Total Hours reported, with an average of 10 Hours 24 Minutes play-time per person. According to the numbers, each play session lasts roughly 1 Hour 16 Minutes(if my math was right). Carnival Games MiniGolf has 726,361 Total Hours reported, with an average of 9 Hours 50 Minutes play-time reporting per person. Each play session for Carnival Games MiniGolf lasts approximately 1 Hour 33 Minutes. Carnival Games' Amazon.com sale rank is #139 and it's currently on sale for $19.73. Carnival Games MiniGolf's Amazon.com sale rank is #1,186 and its current selling price is $19.27. Carnival Games' current GameRankings.com review score average is 59.23%, based on 22 reviews. Carnival Games MiniGolf's GameRankings.com review score average is 44.89%, based on 9 reviews. While the "professional" game reviewers did not seem to enjoy the game all that much, the Amazon.com user reviews show a different side, at least in one case I believe. Carnival Games' Amazon.com "customer reviews" would put the game at about an 80%, based on 304 customer reviews. Carnival Games MiniGolf's Amazon.com "customer reviews" would put the game at about a 70%, based on 50 customer reviews. The customer reviews average puts both games review scores about 20% higher, than "professional" review scores. At Nintendo's E3 press conference this year, they showed a trailer for a sequel to the original Carnival Games. The sequel is named New Carnival Games, and as of now has a release date for September 21, 2010 with a MSRP of $39.99. New Carnival Games will also be compatible with the Wii MotionPlus controller accessory. I think it is interesting seeing a sequel being released a full three years after the original game. Perhaps it is because the original Carnival Games is still selling so well, because most of the "party" based games on the Wii seem to have sequels released yearly, back-to-back. I have not played either Carnival Games or Carnival Games MiniGolf, but I am glad to see New Carnival Games using Wii MotionPlus, and releasing with a MSRP of just $39.99, instead of $49.99. If you have played either Carnival Games or Carnival Games MiniGolf, do you agree more with the "professional" reviews or the customer reviews? Would you recommend(or not recommend) either Carnival Games or Carnival Games MiniGolf to other Wii owners? I've never played any. Looks interesting though. I'm always wary of third party mini game collections. So I've never played this one. But I wonder if it will go like Boom Blox for the Wii, where the first games sold really well, but the sequel didn't do very well at all. I agree with The Butcher. I bought Super Monkey Ball something and it was lame. Since then I avoid 3rd party mini game collections like the plague. Not sure though, as I have never played it. "But I wonder if it will go like Boom Blox for the Wii, where the first games sold really well, but the sequel didn't do very well at all." Kind of interesting, I made a comment similar to this today. I wonder if that's the reason for such a delay in release. I have played two of the Super Monkey Ball games, but only briefly. My wife and I have enjoyed the Rayman Raving Rabbids games though. Who thinks Wii Party is going to sell like hotcakes? "Who thinks Wii Party is going to sell like hotcakes?" I don't think it's worth $50 though. I have a draft saved for this topic soon. Monster Hunter Tri: Rathian Burning Up My Time!